Woo hoo! We are exceptionally thrilled to announce that we have just scooped an amazing two - yes TWO trophies at the prestigious Be Inspired Business Awards 2017 (the BIBAs) - We are still buzzing with all the excitement! The BIBA awards are run by the North and Western Lancashire Chamber of Commerce and are famed to be ‘the one they all want to win’. It is Lancashire’s largest and longest running business awards programme and was held at the Tower Ballroom in Blackpool on the 15th September 2017. 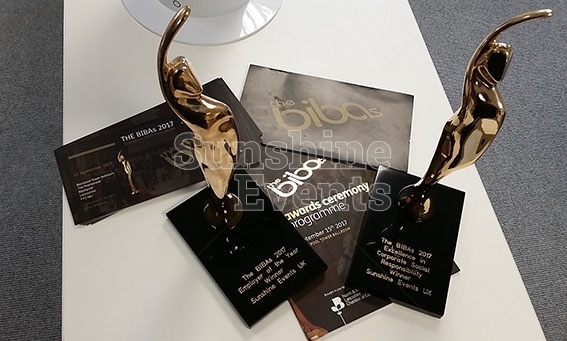 After a visit to our offices by the BIBAs judges in June and a rigorous application process, Sunshine Events were nominated for three BIBA awards namely 'Employer of the Year’, 'Excellence in CSR' and ‘Leisure Business of the Year’. On the night of the awards, the Fun Experts, all dressed up in their finest gladrags, were thrilled to find themselves seated in the beautifully themed Tower Ballroom (home of Strictly Come Dancing’s Grand Final) surrounded by 1,000 of Lancashire’s top business brains. The atmosphere was amazing and anticipation was in the air as celebrity presenter Nigel Havers took to the stage to announce the winners. The Sunshine Events team were over the moon be be announced, not only as the winner of 'Employer of the Year', but also in the ‘Excellence in CSR' category, as we took to the stage for the second time that night. We were just pipped at the post for the final award - but hey - two out of three ain’t bad! EMPLOYER OF THE YEAR: The ‘Employer of the Year Award’, sponsored by Preston College, was a big achievement for the company. Being a good employer is a lot more than just being able to retain top talent - it’s about developing staff and nurturing their skills, being flexible and offering a great working environment and Sunshine Events provides jobs to over 50 local people. CORPORATE RESPONSIBILITY: Sunshine Events are proud to be the first carbon reduction events company of its kind in the UK, so really appreciate our new 'Excellence in CSR’ BIBA award recognition, sponsored by The Community Foundation for Lancashire. All of our vehicles are fuel efficient and the logistics team work hard to reduce the impact of business miles by planting 10 trees in the North West of England every month to help offset carbon dioxide emissions. We also like to help people who are not so lucky as ourselves and support Rock FM's Cash For Kids campaign - and through our partnership with Buy1Give1, are able to help charitable projects all around the world. The evening was topped off by a performance from BoyzLife and music by Smooth FM, which got everyone (including our Fun Experts) dancing away at the party afterwards. What a night to remember! Finally - view the video of the us recieving our BIBA 2017 Awards! Whoop whoop! * Find out more about the BIBA Awards. What makes the perfect Christmas party?